A cron is a service that allows a user to automatically execute a script at a specific time. For example, you can set a particular PHP script to be automatically executed everyday at midnight. Log on to your cPanel Interface. Select the specific time from the lists provided. You should enter the command to run in the "Command" field. You should make sure to enter the proper command and the full path to the file. If you are not sure the command path, you could ask your hosting angency. Log on to your Plesk Panel Interface. Go to "Subscriptions" section click "Your Subscription". 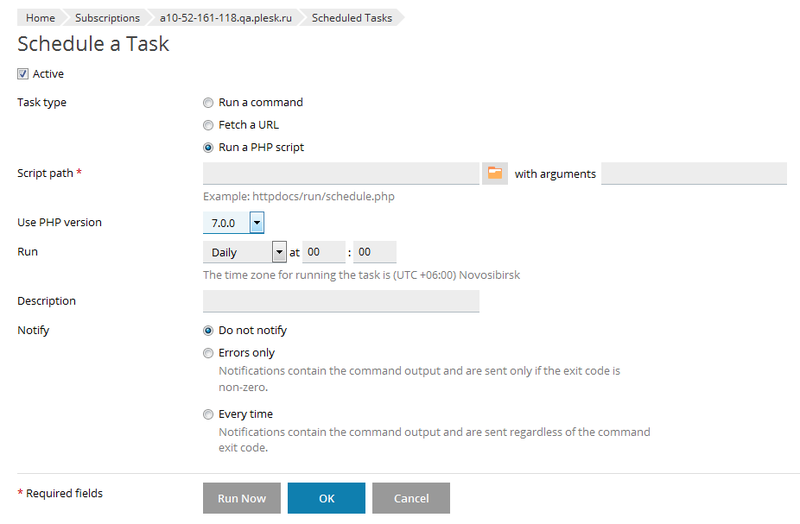 Click on "Show advanced operations"
Pay attention to interface changes for Plesk 11.5 and Plesk 12+ - there is no need to open "Show advanced operations". Your can choose root, but it's not recommended for security reasons. Direct call of php binary with your script as argument. Note: Pay attention to interpretation path, ...Additional\PleskPHP55\php.exe it path for PHP 5.5, you can change PleskPHP55 to PleskPHP5, PleskPHP53 or PleskPHP54 to use another PHP version.